The Canadian Museum for Human Rights in Winnipeg, Manitoba opened its doors in September 2014. 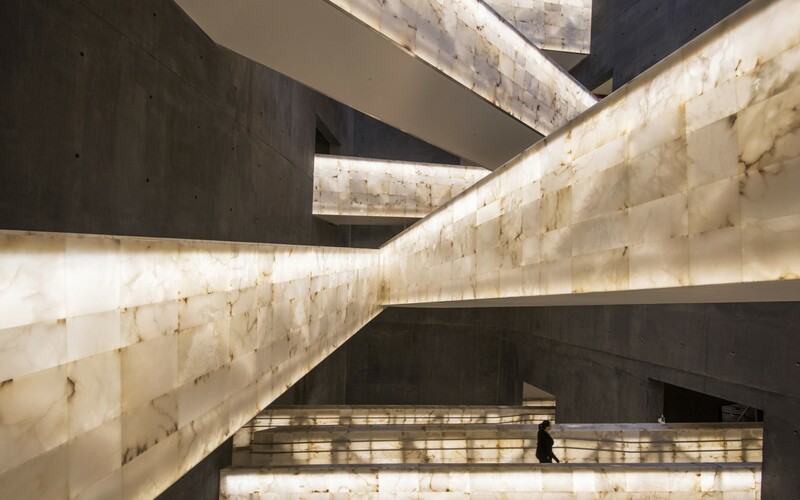 Architect Antoine Predock developed a concept of illuminated alabaster ramps to provide a space for visitors to clear their minds between galleries. 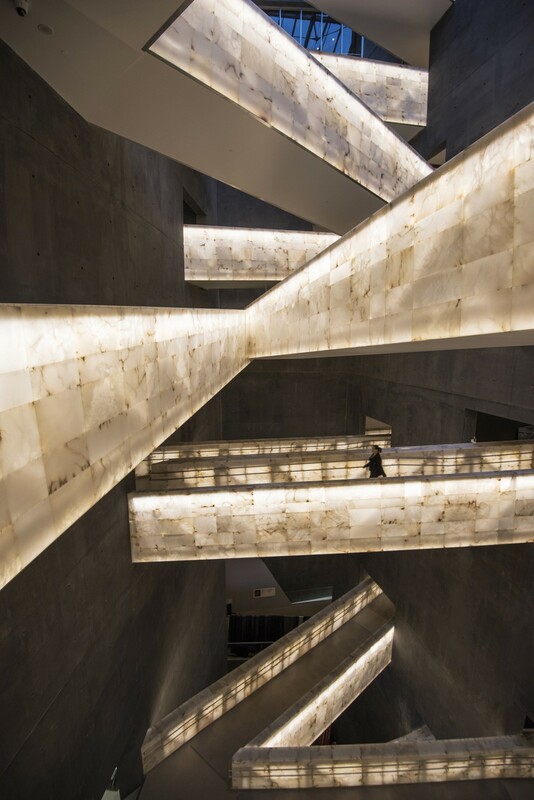 The ramps are uniformly, internally illuminated, a challenge given the density of the alabaster. To achieve this, Mulvey & Banani Lighting used high-output Lumenfacade Interior luminaires. The luminaries are installed in continuous runs in the cavity along both sides of the ramp, using narrow beam angles to backlight the stone. 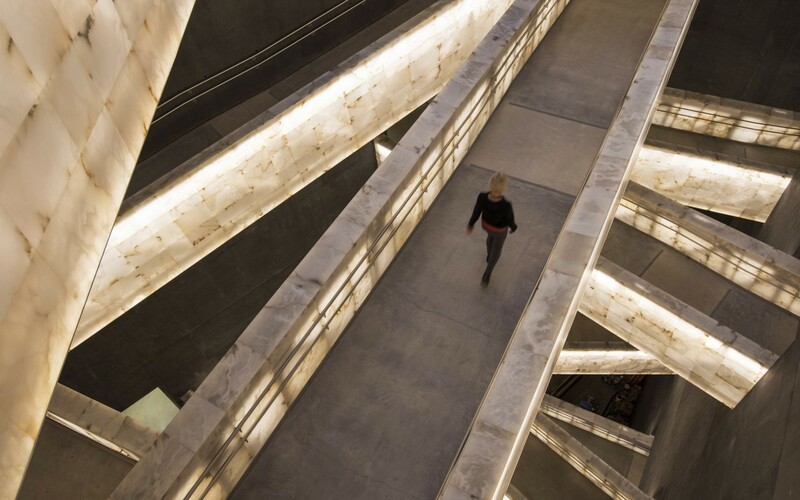 Lighting Design: Mulvey+Banani International Inc.
Mulvey & Banani Lighting used high-output Lumenfacade luminaires to illuminate the unique alabaster-clad ramps at the Canadian Museum for Human Rights in Winnipeg, Manitoba. 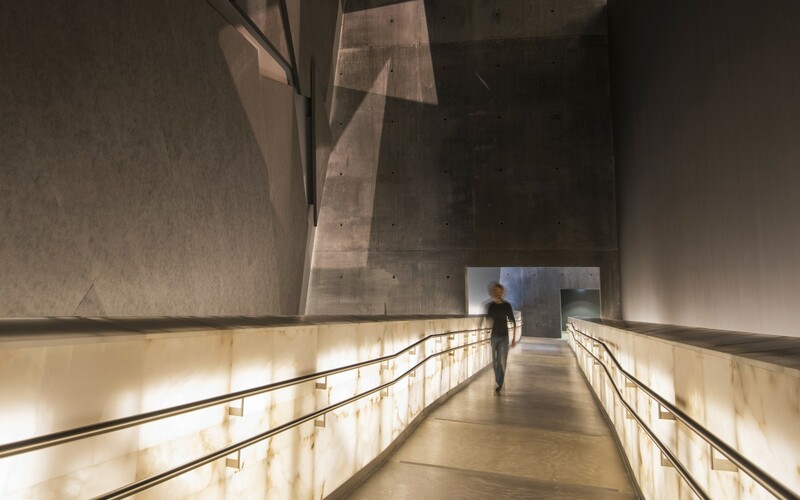 The alabaster ramps are the key element to the visitors’ experience because they link the galleries and provide a space for them to clear their minds. Mulvey & Banani Lighting Inc.
At the Canadian Museum for Human Rights in Winnipeg, Manitoba, architect Antoine Predock developed a concept of illuminated alabaster-clad ramps, which would guide visitors from the darkness of the ground level to the top of the museum's spire, the Tower of Hope. 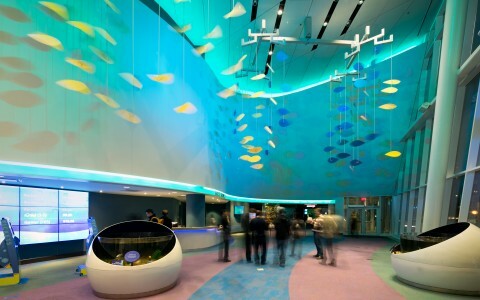 To bring this concept to life, Predock turned to lighting designers Mulvey & Banani Lighting. 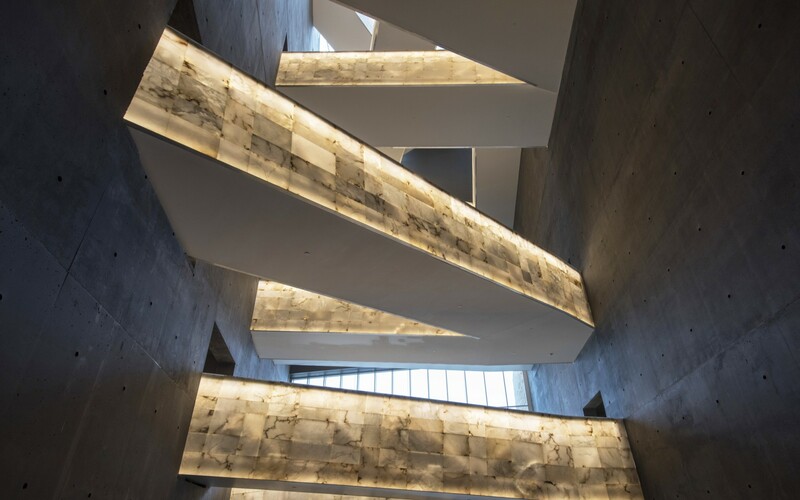 "The alabaster ramps are the key element to the visitors' experience because they link the galleries and provide a space for them to clear their minds," says Paul Boken, vice-president of Mulvey & Banani Lighting. "The lighting for the ramps, therefore, was the most important element all of the architectural gestures because light is so critical in this space." Predock's concept called for the ramps to be uniformly, internally illuminated—a challenge given the density of the alabaster, which is approximately 20-mm-wide with a 300-mm-thick cavity in the middle. 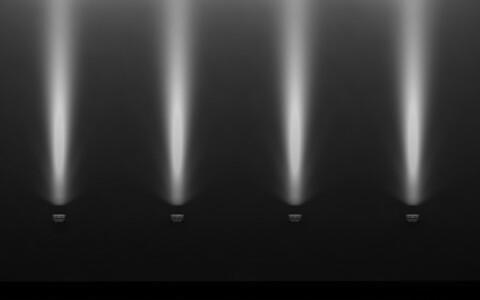 After experimenting with several options, the design team found their solution with high-output Lumenfacade Interior luminaires. "We worked on this project for many years, and we were there every day at points doing mock-ups with the contractor, and as soon as we put in this product it was clear that it was better than any of the lights we had tested," Boken says. Installed in continuous runs in the cavity along both sides of the ramp, the luminaires use narrow beam angles to backlight the stone, creating a uniformly illuminated, and unique, light box application. 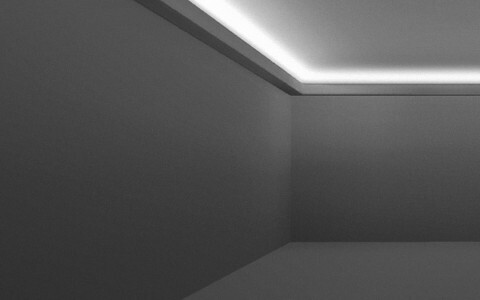 "At that point in time, having a light fixture could produce 1,000 lumens per foot for 100-plus hours with different optic and intensities was rare," recalls Boken. He adds that though the luminaires were specified in 2010, Mulvey & Banani Lighting would choose them again for the application: "We specified it then and we would use it again today. 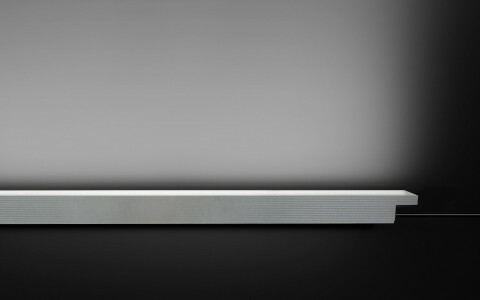 Lumenpulse is at the leading edge with the Lumenfacade product. They were from day one and they still are." After more than a decade of design, development and construction, the museum opened in late 2014 to critical and public acclaim. "The ramps are the heart of the building and they're the most photographed element in the museum," Boken says. "When you go from one to the next, it's just gorgeous. It's awe-inspiring."